... a story that started long time ago. Rings were first glimpsed around Saturn by Galileo, and sparked the interest of great mathematicians such as Maxwell or Poincaré. In the late 1970's and early 1980's, all the other giant planets, Jupiter, Uranus and Neptune were known to host ring systems. They exhibit a rich panel of dynamical behaviours also encountered in galactic disks or protoplanetary nebulae. Then came surprises, not to say incredulity, when dense rings were discovered in 2013 around a small Centaur object, Chariklo, orbiting between Saturn and Uranus. Bis repetita in 2017, with now a ring detected around the dwarf planet Haumea, at more than 50 astronomical units from the Sun. 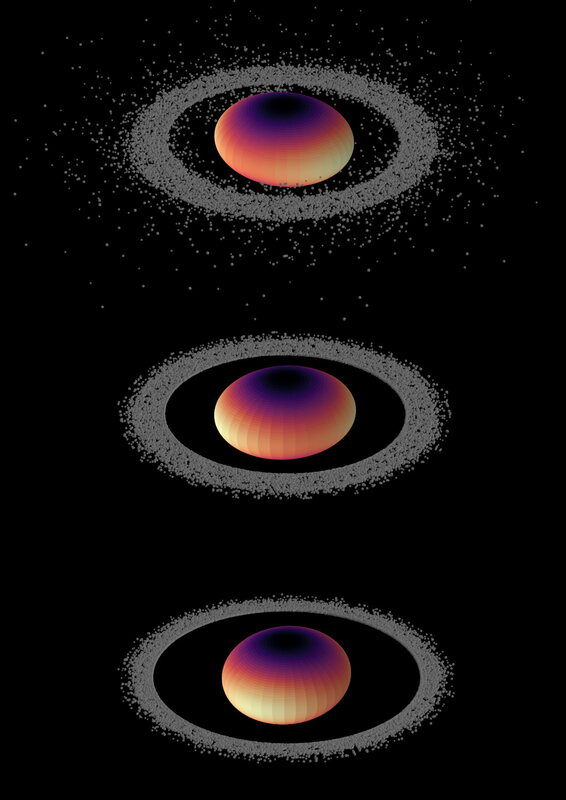 These discoveries were based on ground-based stellar occultations, a phenomenon that occurs when a body of the solar system comes in front of a star and blocks its flux, revealing its size, shape, possible atmosphere and, in the case of Chariklo and Haumea, rings. I organized several occultation campaigns, as illustrated in the cover image, taken by Jean-Luc Dauvergne (©) at the Gifberg amateur station in South Africa during an occultation by Chariklo's rings in April 2014. As observations piled up, I got interested in the dynamics of those “pocket rings”. They are two orders of magnitude smaller than their cousins of the giant planets, and share some common dynamics. For instance, they are narrow, dense and sharply confined, thus reminiscent of the Uranian rings, that could be confined by small “shepherd satellites” only a few km across. The timing was good. Observing is fun, and so is Celestial Mechanics (yes…). Using pen and paper is a good alternative to carrying around telescopes, and vice versa. Rapidly, some back-of-the-envelope-calculations showed that small bodies and giant planets have an obvious difference: size!... And concomitantly, they are much less regular than gaseous planets. They can sustain topographic features or global distortions that are huge, relatively to the body, when compared to those of the giant planets. Such features cause resonances between the spin period of the body and the particle mean motion. The strongest of them involve ratios (m-1)/m (m integer) between the angular velocity of the particles and the spin rate of the body. For instance, the 4/5 resonance means that the particle completes 4 revolutions around the body when the latter completes 5 rotations. Those resonances (technically known as Lindblad Resonances) are found in a wide variety on contexts: galaxies, circum-stellar and proto-planetary discs. An interesting property they have is that they exert a torque on the disc. Particles inside the synchronous orbit – where the orbital period matches the rotation of the body – are driven onto the body, while particles outside that radius are pushed away to more peripheral regions. Our study shows that a 5-km topographic feature may cause the clearing of the synchronous zone in less than one million years, a short time compared to the age of the solar system, some 4.5 billion years. The effect of an elongation is even more spectacular, and involve decadal time scales, as illustrated above. A numerical integration shows the evolution of 700 particles orbiting an ellipsoid with axes 314x278x172 km describing Chariklo. The particles are submitted to a dissipative force that simulate collisions. After 3 months (upper panel), most of the particles inside the synchronous orbit (about 20% outside Chariklo’s largest axis) have fallen onto the body. After a year (middle panel, all the inner zone has been cleared, and after twelve years (lower panel), the particles continue their outward migration (Credit: Rodrigo Leiva). This mechanism has far-reaching implication for satellite formation around small bodies. For instance, an initial collisional disc resulting from an impact could partly collapse onto the body, and partly migrate outside, explaining why both Chariklo's and Haumea's rings are relatively far way from the body. This material may even in some cases reach the Roche limit, and eventually accrete into satellites. Other applications are possible. Such as the equatorial ridge that encircles Iapetus, a Saturnian satellite. It could be a left-over of some ancient ring that have been pushed onto the surface by the mechanism described in this work.